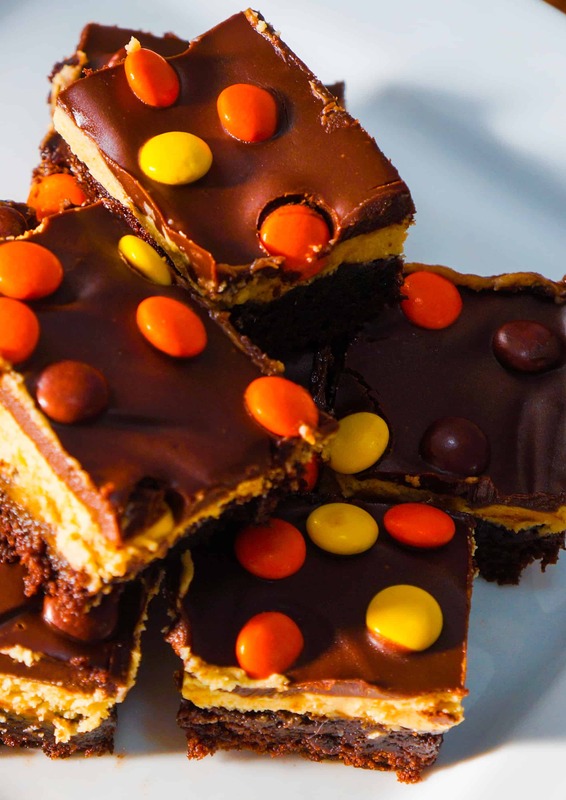 These Reese’s Pieces Cream Cheese Brownies are the ultimate dessert for chocolate and peanut butter lovers. Today I had a massive craving for chocolate and peanut butter (happens to me often), so I decided to experiment with a new brownie recipe. As I was planning out my recipe I threw some cream cheese in there for good measure because who doesn’t love cheesecake? I chose to use boxed brownie mix to save time (with a nine month old underfoot time is hard to come by) but you could use your favourite from scratch recipe if you prefer. I started by preparing the brownie mix according to the instructions on the box and then divided the batter between two eight inch square pans. I baked the brownies until a toothpick inserted in the centre came out clean. I blended together some cream cheese, peanut butter, butter and icing sugar to make the cheesecake layer. After the brownies had cooled, I spread the cream cheese mixture on top of them. For the top layer I combined melted chocolate chips and butter with warm milk. 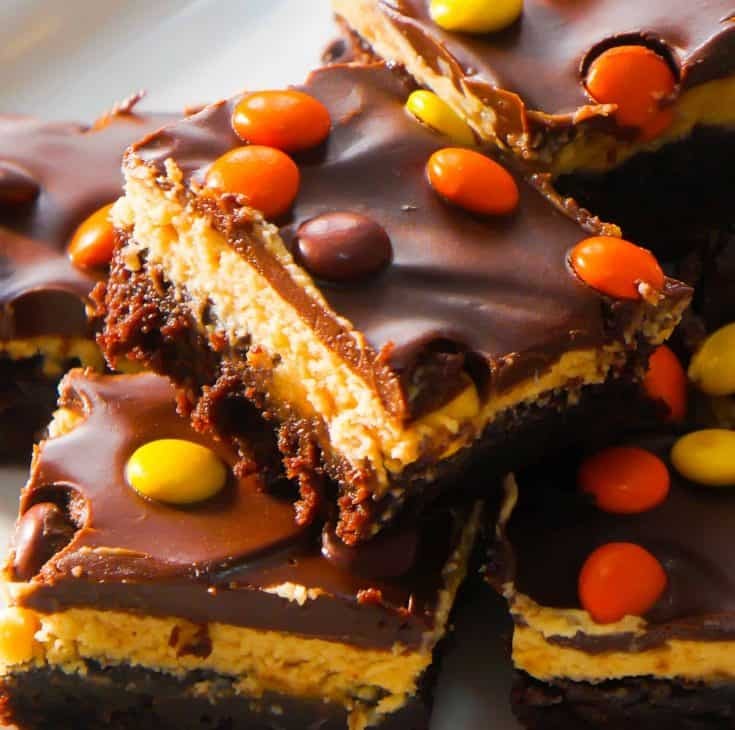 I spread the chocolate mixture over the cream cheese layer and then sprinkled some Reese’s Pieces candies on top. The brownies were chilled in the refrigerator for two hours before slicing and serving. These peanut butter cheesecake brownies turned out amazing and were super easy to make. 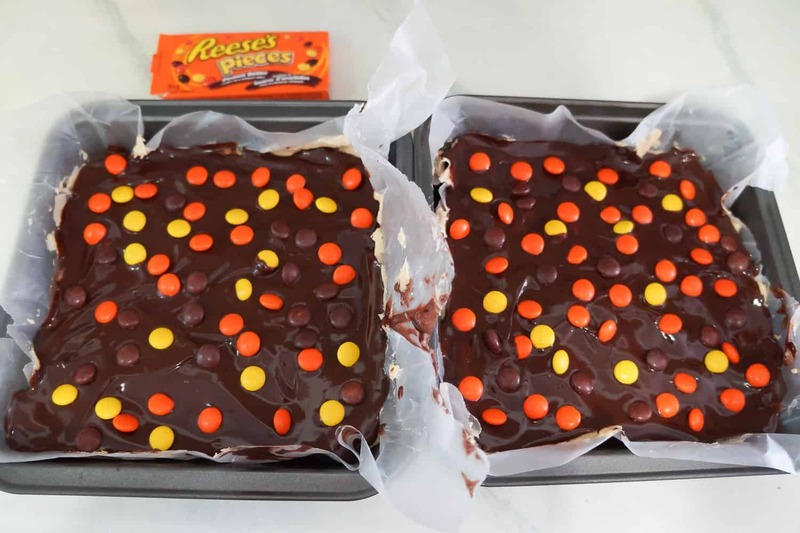 Try these Reese’s Pieces Cream Cheese Brownies the next time you are in need of a delicious chocolate and peanut butter dessert. If you are looking for more chocolate and peanut butter desserts check out Peanut Butter Cookie S’mores Cups, Peanut Butter Ritz Bits Toffee, Peanut Butter Chocolate Chip Cookie Bars and Chocolate Peanut Butter Cheesecake Dip. 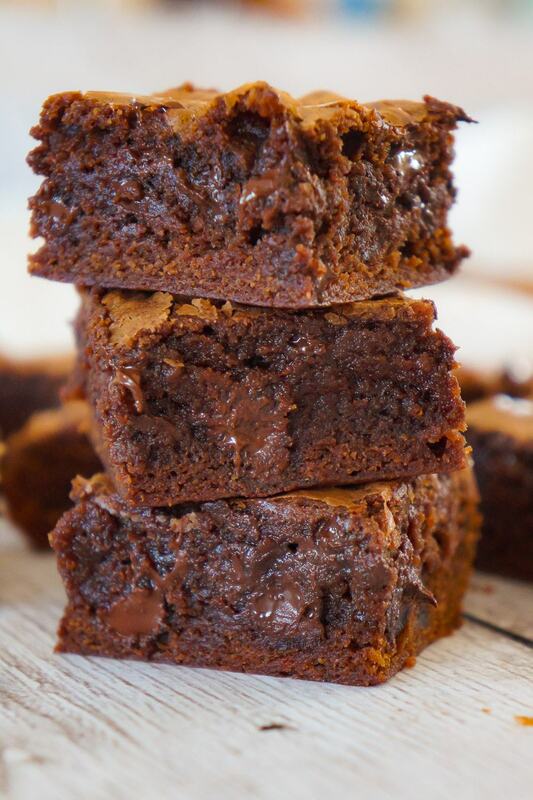 Another delicious peanut butter brownie recipe. 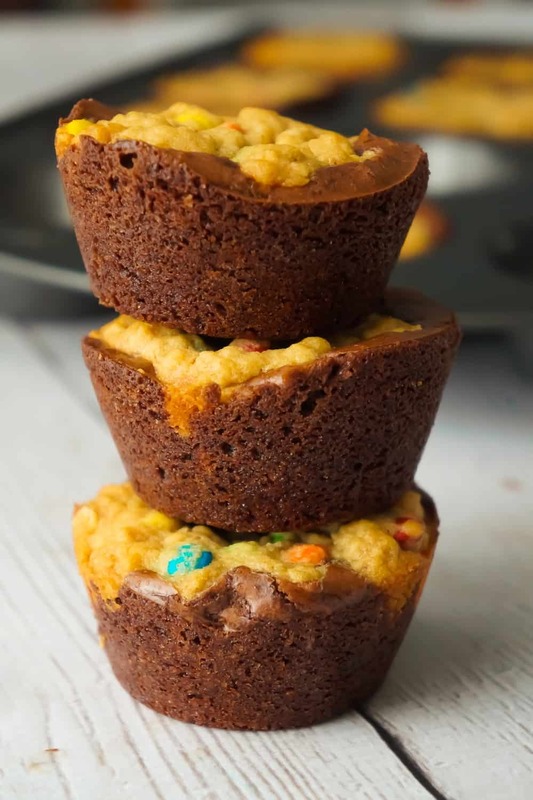 Check out these Monster Cookie Brownie Cups! 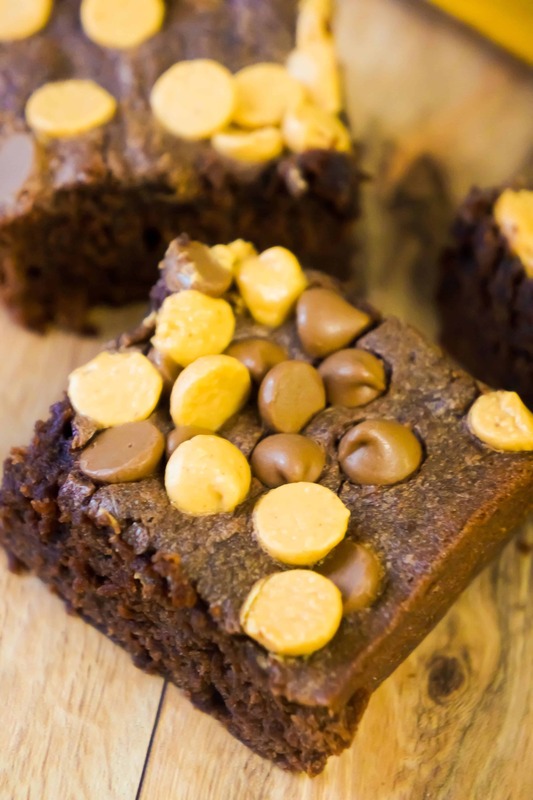 Be sure to also check out these Peanut Butter Banana Brownies! 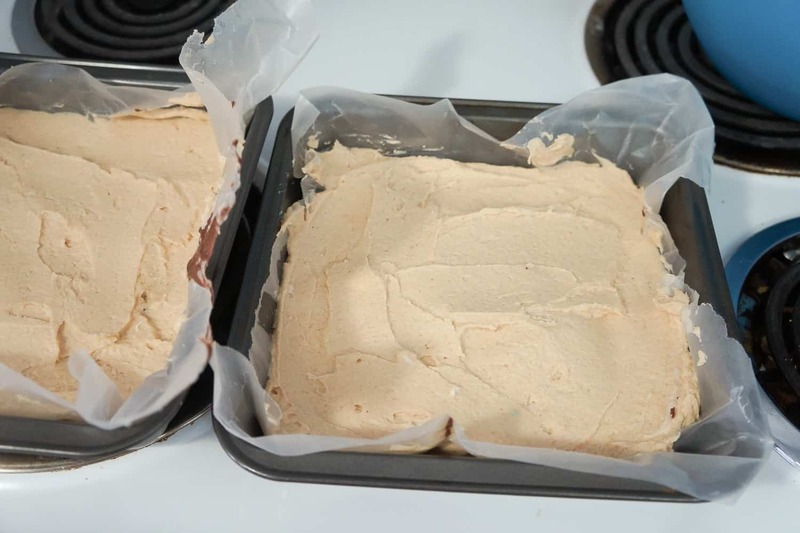 Another delicious peanut butter and cream cheese recipe. 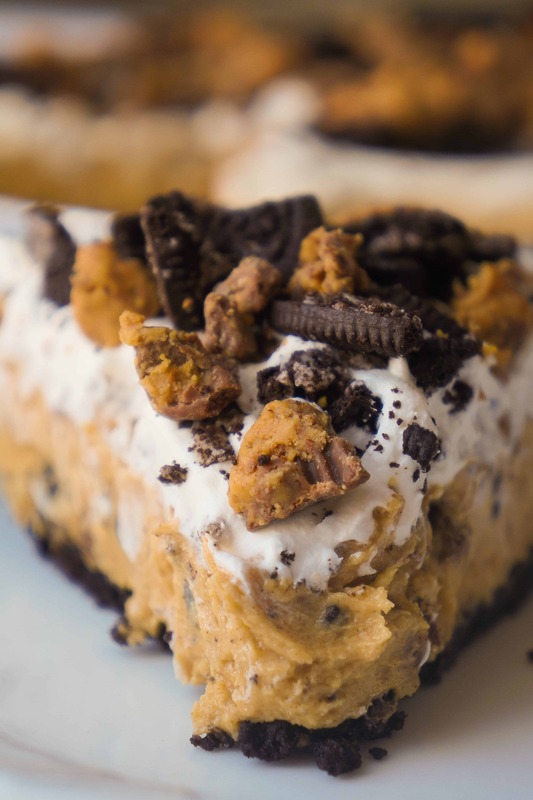 Check out this No Bake Oreo Peanut Butter Cup Cheesecake! 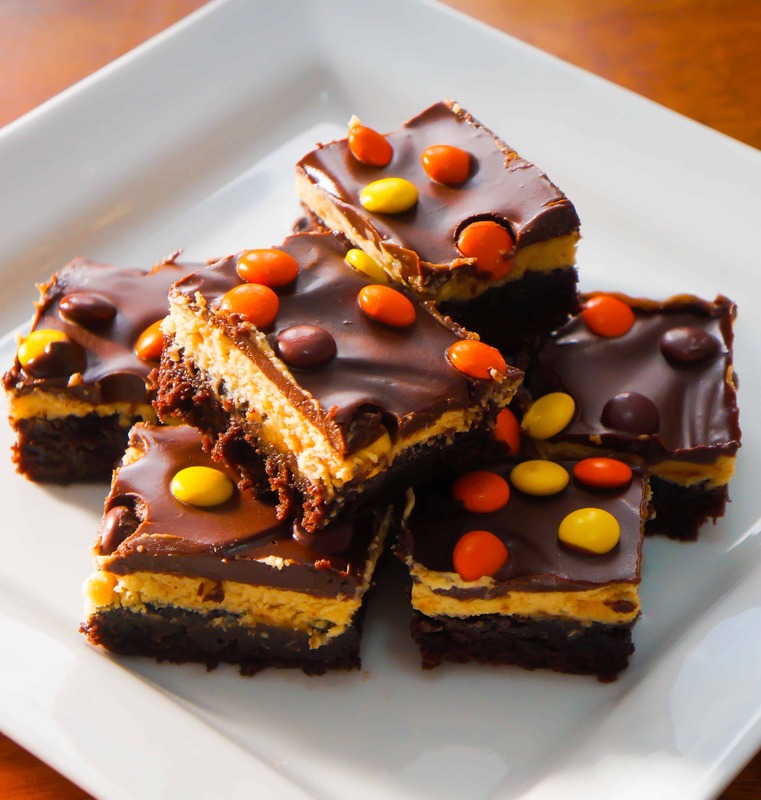 Reese's Pieces Cream Cheese Brownies. These peanut butter cheesecake brownies are the perfect dessert for peanut butter lovers. Prepare brownie mix according to instructions on the package. Instead of using one 8-inch pan divide the mix between two 8-inch pans. 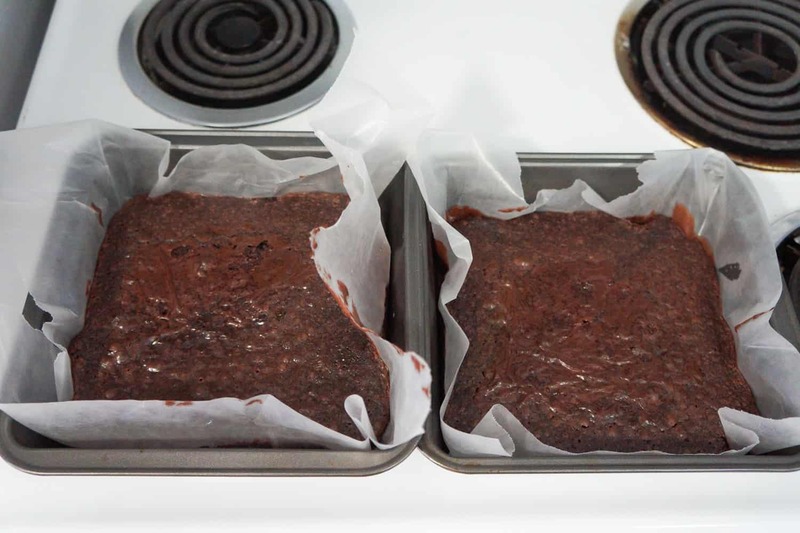 I like to line my pans with wax paper to make it easier to pop the brownies out. Remember to reduce cooking time as mix is spread thinner. While brownies are cooking prepare the cream cheese layer. 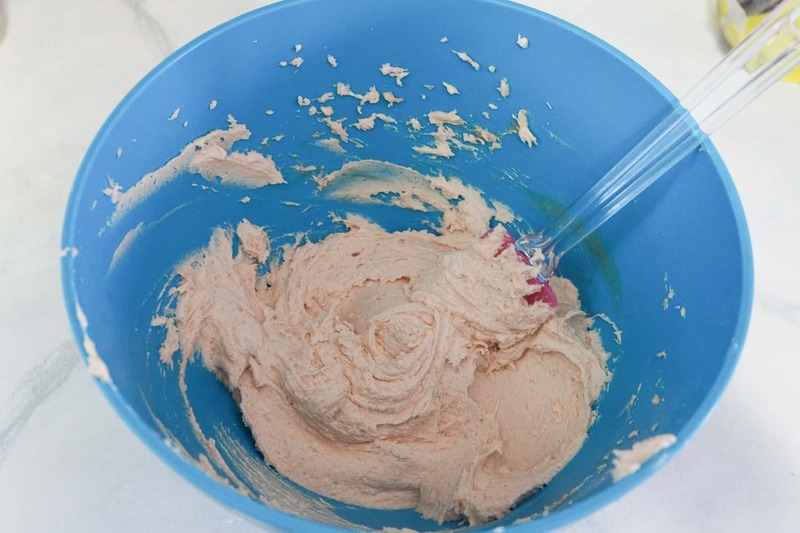 Blend cream cheese, peanut butter and 1/4 cup butter with electric mixer. When combined slowly add icing sugar. 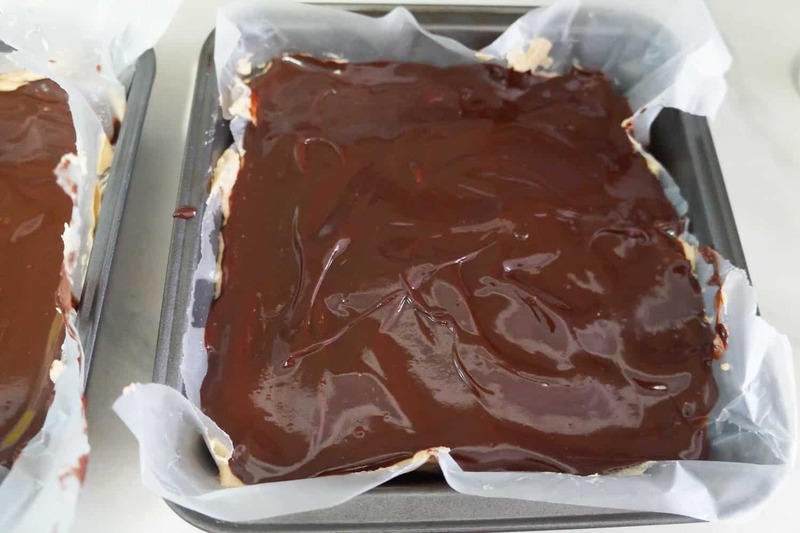 Allow brownies to cool and spread the cream cheese mixture evenly on top. In a medium saucepan melt 1/4 cup butter and the chocolate chips. Once fully melted stir in the warm milk. Spread chocolate mixture over the cream cheese layer. Top with Reese's pieces candies. Refrigerate for at least two hours before cutting.